The WP-571 is a DGKat wall plate transmitter for HDMI signals. 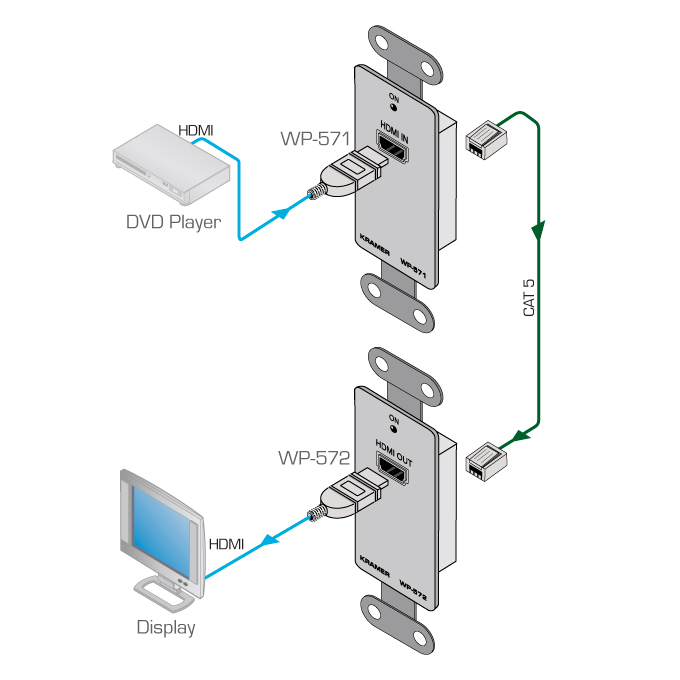 The WP-571 converts an HDMI signal to a DGKat twisted pair signal that it transmits to a WP-572. Cable - Requires shielded twisted pair (STP) cable. For optimum range and performance use Kramer's BC-DGKat524, BC-DGKat623 and BC-DGKat7a23 cables. Note that the transmission range depends on the signal resolution, graphics card and display used. The distance using non-Kramer CAT 5, CAT 6, and CAT 7 cables may not reach these ranges. Use only shielded cable where both ends of the shield are soldered to ground. Active Power Indication - The ON LED lights red when receiving power only, orange when either input or output and power are attached, and green when both an active input and output are attached.